Liu Yamei's embroidered scroll on a Buddhist theme was far too long to unravel at the China Times Memory Exhibition in Sri Lanka, but it nonetheless wowed the hundreds of Sri Lanka's visitors attending the three-day show. As one of China's leading "cultural heritage inheritors," Liu came here as a kind of unofficial cultural ambassador with very impressive credentials. Her Manchu embroidery stretches 50 meters, took six years to make and holds the Guinness World Record for the largest embroidery by an individual. 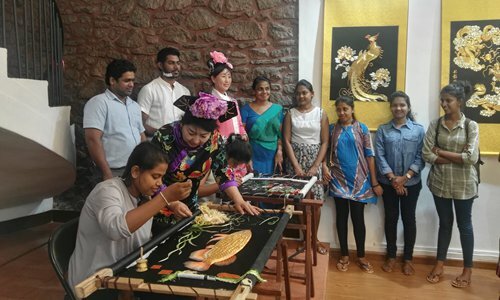 Her piece was one of 60 culture heritage artworks from China on display at the exchange that was designed to further mutual understanding and trust among the people of the two countries and add impetus to the Belt and Road initiative, several Sri Lanka government ministers told the Global Times. The exhibition, which ended on Wednesday, aimed to reenergize ancient cultural links that began with the 5th century Chinese monk Fa Xian who returned home with Buddhist scrolls, and the voyages of Zheng He, the Chinese mariner who erected landmarks on Sri Lanka more than 500 years ago. "Exchanges between the two countries have been going on for more than a millennium and will become more diverse as the [Belt and Road] initiative is implemented, said S.B.Nawinne, Sri Lanka's Minister of Internal Affairs, Cultural Affairs and Wayamba Development. "Exchanges on intangible culture heritage between China and Sri Lanka have found new momentum in years with the advent of Belt and Road initiative," said Liu Dong, Cultural Attaché to the Chinese Embassy in Sri Lanka. The bond between China and Sri Lanka extends beyond culture and tourism. "Greater trade and industry will be seen in the future," predicted Nimal Siripala de Silva, Sri Lanka's Minister of Transport and Civil Aviation. The exchanges also enable Sri Lanka and Chinese people better understand their cultural similarities, which will help create a friendly environment to further promote economic cooperation under the Belt and Road initiative, said Liu. "The artworks are very delicate and culturally specific. They are different from works from other places in the world," said Anuradha Yahampath, director of design at a local handiwork company. "We are seeing China in a different manner now, not only as a country with great artists but also as a global power, which makes it more important to understand the country," said Yahampath. For embroidery artist like Liu, the chance to show her works internationally and receive accolades from aboard is not the only encouragement that makes her endeavor gratifying. Trips like this one, she says, show that China doesn't want crafts like hers to disappear. To better preserve cultural-based art, China is encouraging more people to get involved. Several supporting policies, including government subsidies ranging from 3,000 yuan ($454) to 20,000 yuan are available to some artists. Overall more than 4.6 billion yuan was spent on preserving China's intangible culture works over the past five years, according to a statement from China's Ministry of Culture in October. Still Liu is concerned that many artists who are designated intangible cultural heritage inheritors, and often live in China's remote areas, are struggling to earn a living. Many can't afford to attend exhibitions to display and sell their artworks due to the cost, she said, adding that works by her and her apprentices can sell for as little as 80 yuan and as much as 800,000 yuan. China also needs to help the artworks fully realize their market potential, Zhang Ronghua, a political advisor and chairwoman of Tianjin-based Rockcheck Group, told the Global Times. "Excellent Chinese culture heritages should be revitalized in a new era via innovative market measures. The artworks should be introduced to the world to help foreigners better understand China," said Zhang.